Erin Paterson, a staff member with the Gillies McIndoe Research Institute (GMRI), is about to embark on an exciting visit to the Salk Institute for Biological Studies at La Jolla, north of San Diego in California, USA. 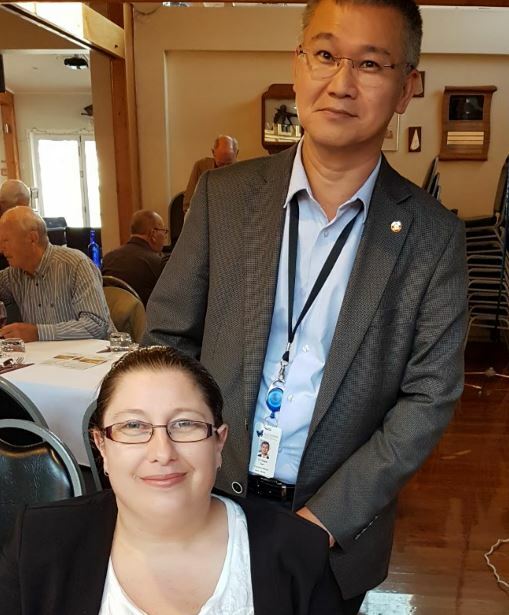 Erin's talk to the club on Tuesday 20 March 2018, began with her thanks for the hard work that Plimmerton Rotary has put into fundraising for the Institute. In 2016, a UK study showed that approximately one-third of all medical research funding came from charities. Accompanying Erin for the evening was Dr Swee Tan, the Founder and Executive Director of the GMRI. Erin graduated from Otago University then spent four years working in commercial diagnostics (New Zealand Veterinary Pathology Ltd). After moving to the United Kingdom she worked at the Kennedy Institute of Rheumatology (University of Oxford) as part of the ARUK Centre for Osteoarthritis Pathogenesis before returning to New Zealand and taking up a position at the GMRI. For the rest of her talk, however, the editor is very grateful for her notes, and to Dr Swee Tan and Dr Tinte Itinteang for approving this post. The Salk Institute was founded by Jonas Salk who developed the first successful polio vaccines. Francis Crick, a British molecular biologist, biophysicist, and neuroscientist, most noted for being a co-discoverer of the structure of DNA in 1953, is one of the founding members. The staff has included six Nobel Laureates including three current staff members and the Institute has been ranked in the top five research institutes in the world. It boasts over 700 staff and students representing 54 countries and has US$134 million in annual funding. While Erin is at the Salk, she will be studying in Professor Inder Verma's lab. Professor Verma’s research focuses on cancer and gene therapies. He is the former editor-in-chief of the Procedures of the National Academy of Sciences (PNAS), one of the world's most cited peer-reviewed scientific journals. The lab uses gene upregulation to take mature cells and bring them back to a stem cell state. From there they can be redirected to a different cell type via upregulation of specific genes. For example, a skin cell being made into a stem cell and redirected to a lung cell. She will be working with induced pluripotent stem cells and disease-specific pluripotent stem cells. This allows perpetual culture maintenance providing more flexibility and reproducibility. One might ask why the GMRI would send someone to the Salk. The original plan was to bring someone to New Zealand to do a full set up but the length of time required was too great. Sending a GMRI staff member to the Salk was the next option. Attempting to set up a new research programme using these techniques relying only on commercially available kits, published research and other lab's standard operating procedures could have made for a longer and more expensive setup process. Nuances are lost and small differences can have big impacts. Travelling to the Salk allows access to world-class facilities and teaching comes from researchers using the techniques as part of their routine work. Tips, tricks and troubleshooting advice can be picked up on the spot. The long-term benefits to the GMRI will be the ongoing support they will receive from the Salk as they set up their own stem cells (iPSC) programme at the GMRI. They will be able to continue to develop and enhance the relationship between the GMRI and the Salk scientists which will hopefully lead to future collaborations and access to resources on both sides. And they will be able to share knowledge gained in the future, leading to benefits for other research groups closer to home. Original generation time 1.2740 seconds.